A 13-day along one of the most scenic, awe-inspiring trekking routes in Bhutan. One day halt to explore Laya, the highest village in Bhutan. Visit Dzongs (monasteries), Lakhangs (temples), museums, villages and places of natural beauty. Short hike to Taktsang Monastery “the famous “Tiger’s Nest”. (Horse ride available on request). Evening of entertainment – performance by traditional musicians and classic Bhutanese dining. One of the most beautiful and varied treks in Bhutan, with close-up views of the high mountains. We highly recommend it. 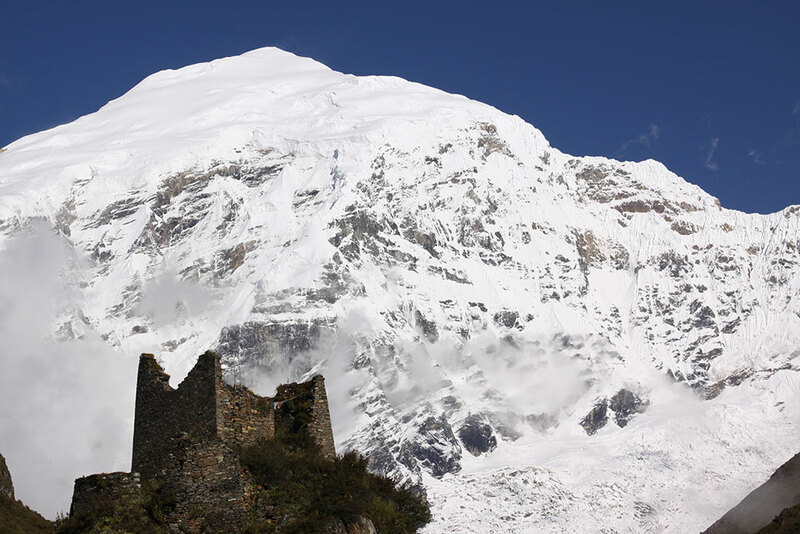 The route follows the Jumolhari trek to Lingshi and continues to Laya at 3,800mts. The highest pass on this trek is 4,900m. Halt a day at Laya and meet the people with their unique, black, yak-wool clothes, their impressive jewellery and their traditional, semi-nomadic way of life. Halt again at Gasa, with its impressive mountain back-drop. From Gasa dzong and the hot-spring baths, descend into the sub-tropical region of Punakha. Follow the farm road and meet your vehicle for the drive through orchid-laden forests to Punakha. In addition to the trek, we will take you on a tour of the sights of Thimphu, Paro and Punakha. Visit the impressive monasteries and temples where Tibetan Buddhism flourishes and red-robed monks chant their prayers. Enjoy watching traditional craftsmen and women at work and visit various folk-heritage museums. Relax, unwind, chat with the locals, take photos and browse in the shops. Trek starts. Shana – Soi Thangthangkha. Alt. 12,664ft/3860m. Distance 19km. 7/8hours. Jangothang – Lingshi. Alt 12,844ft/3,915m. Distance 19km. 5/6 hours. Lingshi – Chebisa. Alt. 12,828ft/3910m. Distance 10km. 6 hours. Chebisa – Shomuthang. Alt. 13,976ft/4,260. Distance 17km. 6 hours. Shomuthang – Robluthang. Alt. 14,400ft/4250m. Distance 18km. 6/7 hours. Robluthang – Lemithang. Alt. 13, 567ft/4090m. Distance 19km. 6/7 hours. Lemithang – Laya. Alt. 12,680ft/3820. Distance 10km. 4/5 hours. Laya- Gasa. Alt. 9,514ft/2900m. Distance 19km 10 hours. Start very early for a very long day’s hike with a short lunch break. Follow the river valley, past some impressive natural, rocky obstacles and awesome glacier-fed rivers. Depending on the season, varieties of flowers are in bloom. Cross the Balela pass (3740m.) before descending through mixed forests along trails well-trodden by the Laya ponies. After the pass the trail is all the way downhill till you reach Gasa. You will be walking along a rough road for the final stretch. The backdrop to the campsite is the beautiful Gasa Dzong and, beyond, a lovely view of the high mountain ranges. Have a leisurely breakfast before visiting the dzong and the village. During the school break time you may get a chance to interact with the school children and other locals. Any time after lunch set out on a short 30 – 40 minute hike down through orchid-laden forests to Gasa hot springs where your camp will be struck for the night. Relax in the hot springs. Enjoy some time at the hot springs before dinner. Drive on the rough road from Gasa hot springs to Punakha. Sightseeing in the Punakha valley. Visit Punakha dzong, Chimmi Lhakhang, the suspension bridge and villages nearby. Alternative option for 2 hours rafting (additonal fee). Morning drive to Thimphu. Visit the Folk Heritage Museum, Institute for the 13 Traditional Arts (Zorig Chusum) and the Textile Museum. You will have some time for browsing in town today. You may wish to make a postage stamp with your own photo on it or enjoy the shop displays of Bhutanese textiles and other items. Dinner in a restaurant in town. Full day sightseeing in Thimphu. Visit the Buddha point, the takin reserve and Chang Gangkha Lhakhang (temple) and the Institute for Traditional Medicine. Take a stroll to the Memorial Chorten where people from all walks of life go to circumambulate the huge stupa Finally, visit the Thimphu Dzong and its huge temple. Dinner at the hotel. Early morning drive to Paro and hike to Taktsang Monastery (the “Tiger’s Nest”).The round-trip takes about 4 hours and includes a visit to the monastery. Free time in Paro. Lunch or dinner in a local farmhouse. Departure from Paro airport……Tashi Delek.